I went through the ‘Introduction to nCloth‘ tutorial today on Digital Tutors. 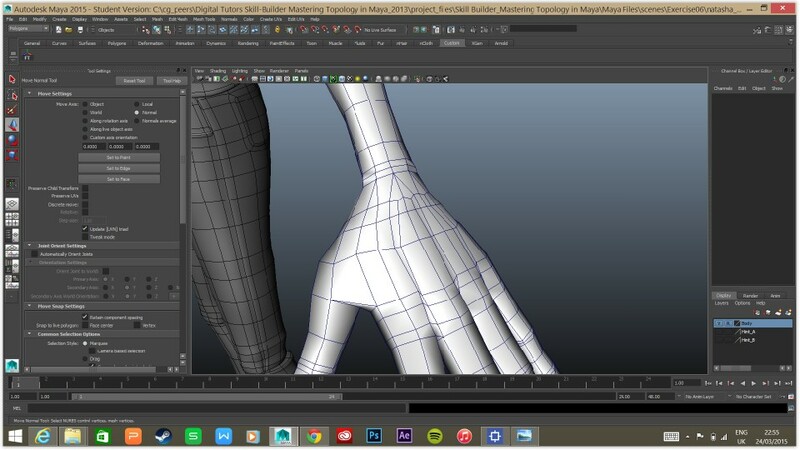 It seems like it will come in useful for animating the floaty quality that we were thinking of for our character. 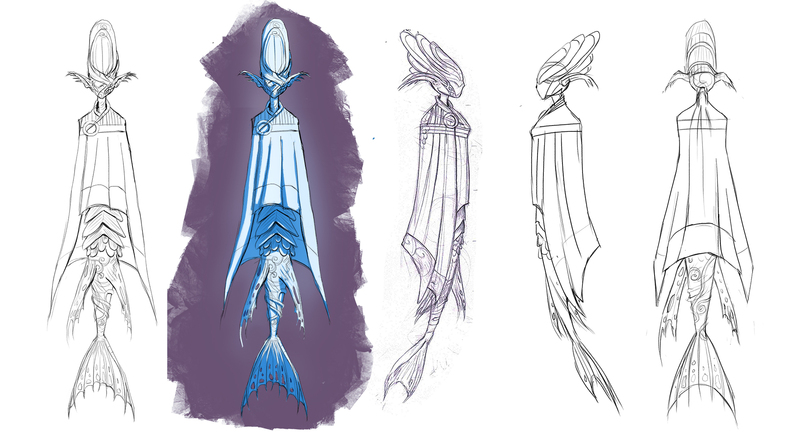 I was thinking that the movement of our character’s cloak and fins could possibly be simulated in a similar way to the flag or dress tests that I did. They could be modeled as separate pieces of geometry which are then turned into nCloth and parented or nConstrained to the main body (like in the pictures above). Do you think that this type of realistic simulation would fit okay with the style of our world? 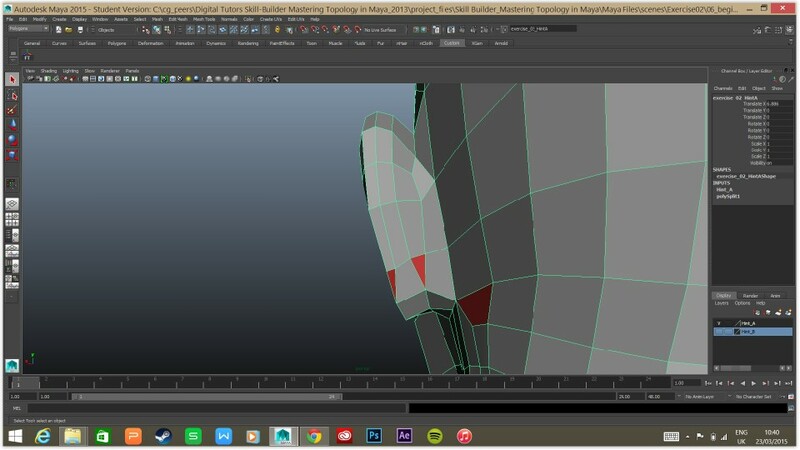 nCloth always works in meters regardless of what unit Maya is set to (so 2cm in Maya is read as 2m by nCloth). This applies to other Maya dynamics also. Adjust playback and max playback. Turn objects that need to interact with the cloth into ‘colliders’. Nucleus (in outliner) controls various things like: wind, air resistance, gravity (9.8m/s^2). values of cloth and collider are accumulative. The importance of scene scale: change the scale attributes in the attribute editor of the nucleus to .01 (100m/100=1cm). Increase the quality of our solver: change settings in nucleus node e.g. steps. Change settings in nClothShape ‘quality’. The input mesh is the original piece of geometry before nCloth was made. The ncloth is a duplicate of the geometry. 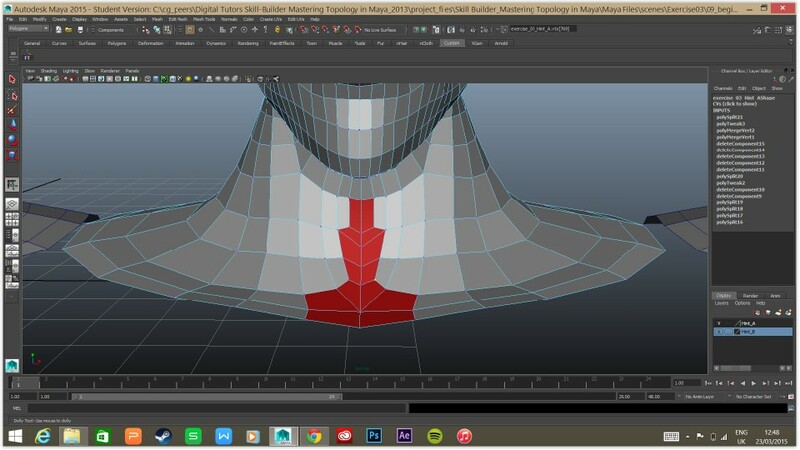 Don’t apply commands e.g .smooth to duplicate mesh. The input mesh is original geo. The ncloth simulation is calculated from the original geo, through the nucleus node and onto the NClothShape then fed back out to outputcloth which is displayed. Therefore apply commands to first part of node chain (original geo) so it can be factored into calculations. Exploring dynamic properties: If scene is modeled in cm you need to adjust the ‘lift’ attribute of nclothshape. Also adjust stretch and compression resistance. simulate movement through ‘local force’. how to make it feel more like the material? collision: ‘thickness’ ‘solver display dropdown’. collision surface on both ncloth and colliders. ‘self collision thickness’. ‘self collision flag dropdown’ vertex suffices. Get rid of unwanted jittering and noisyness: nucleus solver attributes. nclothshape quality settings. ‘damp’ sometimes works. Attributes can be keyframed at certain stages where there’re problems. high substeps and max collisions might be needed to get rid of jitters. keyframe the ncloth inputs ‘is dynamic’ on/off. working with constraints: constraints can be applied directly on ncloth. 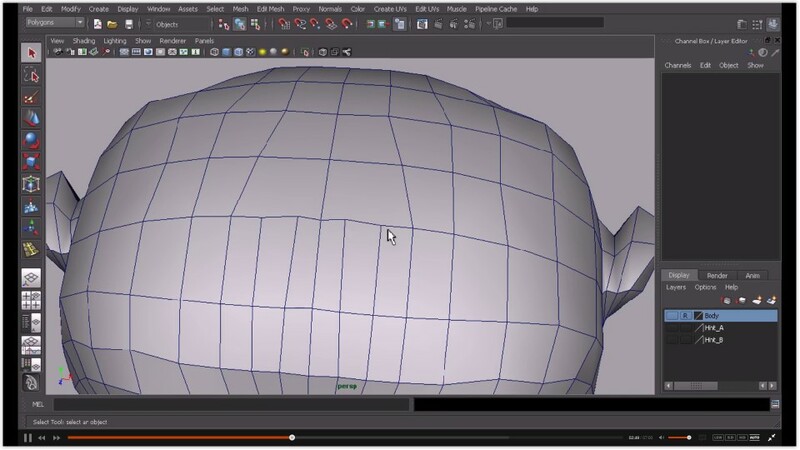 Apply transform constraint to vertices at point of force. Parent locator to mass that moves. 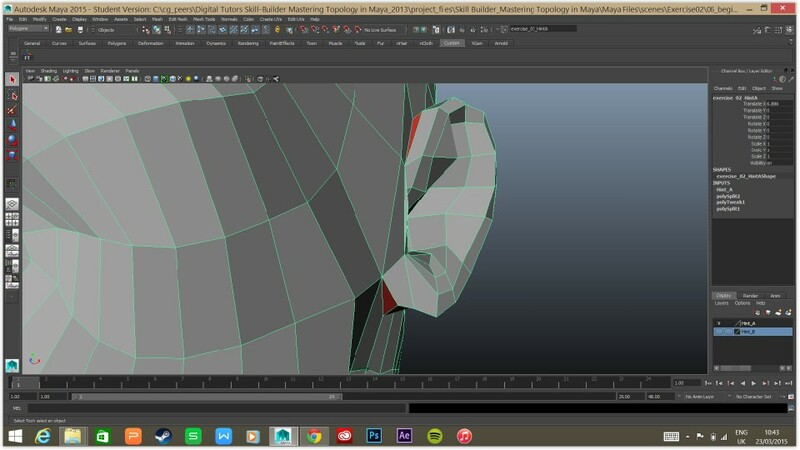 Use ‘remove members’ to remove vertices. from constraint. Creating tearing cloth: select area to be torn with lasso and create ‘tearable surface’. See stretch resistance under ‘dynamic properties’. 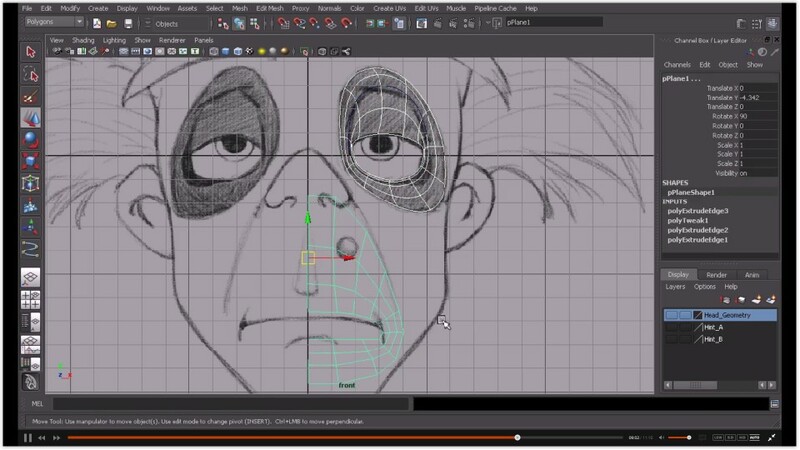 Use dynamicConstraintShape to tune the tear. Dynamic property maps: e.g. stretchiness that varies over object or certain parts that bend. wrinkle map e.g. from a file of painted wrinkles. For animated wrinkles, connect e.g fractal instead of file. Edit attributes to make longer shapes. Keyframe the offset for motion. ‘Wrinkle map scale’ influences strength of wrinkle map effect. 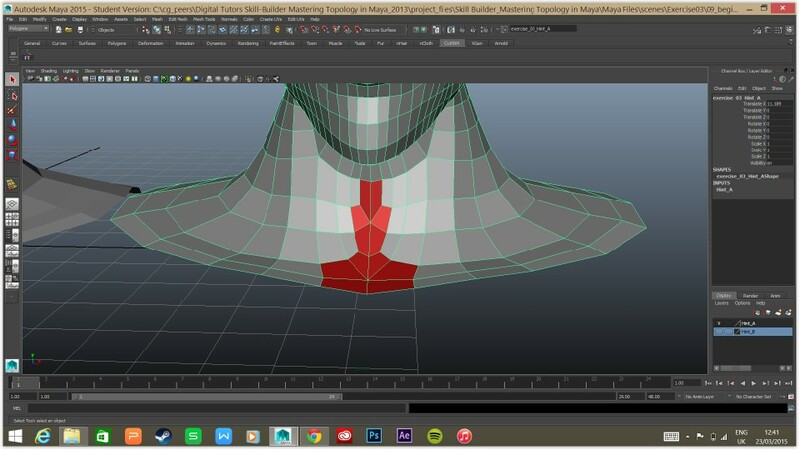 simulating cloth on a moving character:select vertices and then shift-select the collider surface that the vertices are to follow then choose ‘point to surface’ constraint. Select bones then ‘select -hi’ in MEL to select rest of hierarchy of bones and move t-pose to something like -50. That way we can start ncloth simulation before main body animation (gives time for cloth to relax). Identifying potential problems: frames when geo passes through cloth will confuse the cloth simulation. In ‘evaluate nodes’ disable ncloth. Scrub animation for points where two pieces of geometry go through eachother. Caching nCloth simulations: You can manually adjust values in the attribute editor e.g. 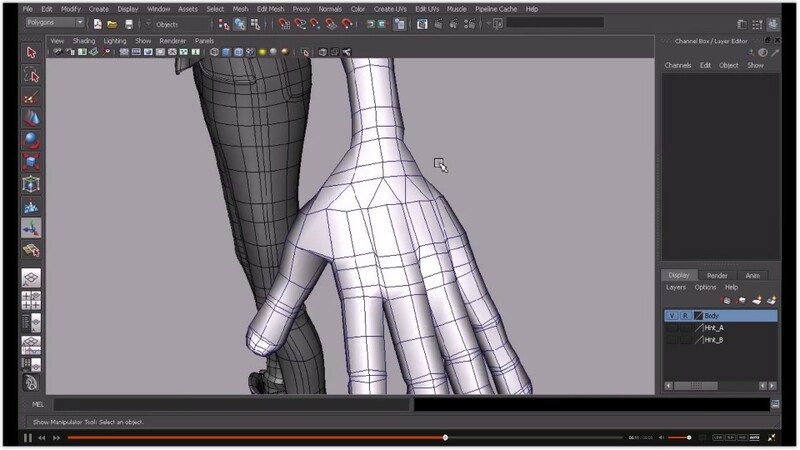 stretch resistance or use Maya presets. ‘Lift’ might need to be changed to match scene scale. Cache the simulation so that when it’s opened on another computer you can be sure it’s the exact same simulation. ‘create new cache’ bakes animation into external file. ‘delete cache’ in order to preview changes. Having a cache allows you to hide the negative frames on the timeline as the cloth will remember the more relaxed position at frame 0. Here’s the character without the backpack. 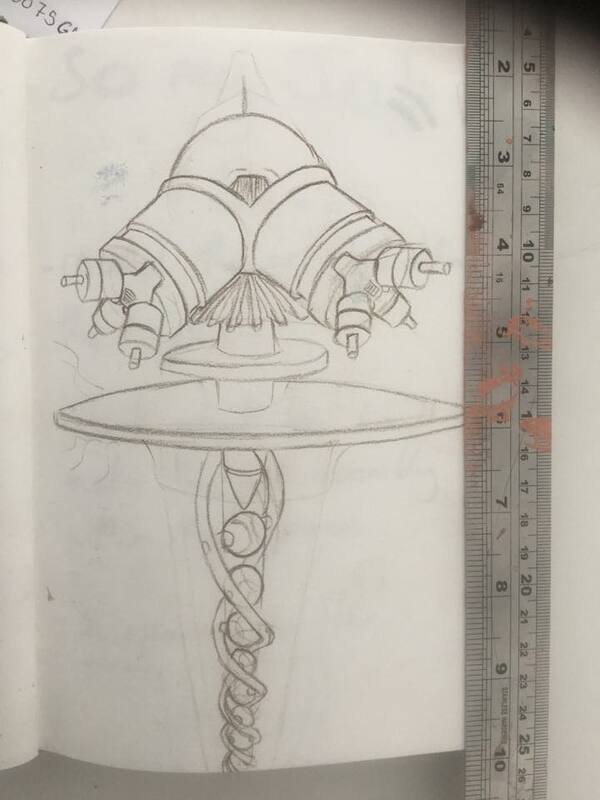 Some details still need developing but is the basic shape okay to begin modeling from? 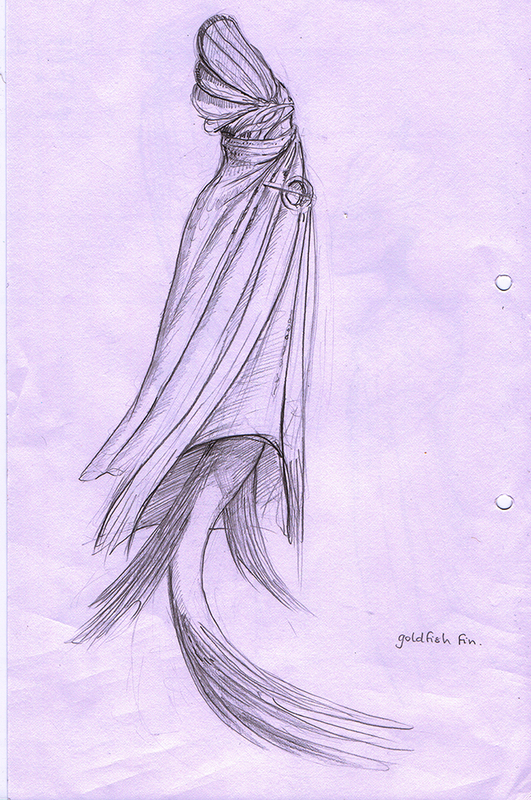 These are some more sketches I did for our character. I wanted to get your feedback before I go doing orthographic drawings for modeling from. Are any of them close to what you’d like? Abigail’s drawings had more chibi-like proportions so is it okay that I’m drawing with slightly more realistic/longer proportions? 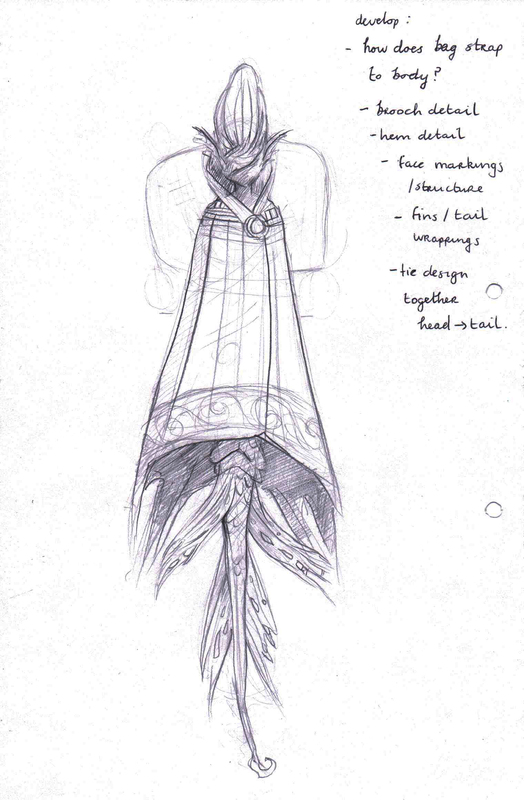 I also think that the cloak makes a nicer silhouette when it fans out at the bottom a bit instead of wrapped tightly. That wouldn’t be too hard to animate would it? I imagine that it will work fine if we play with a heavier ncloth draped over the body. 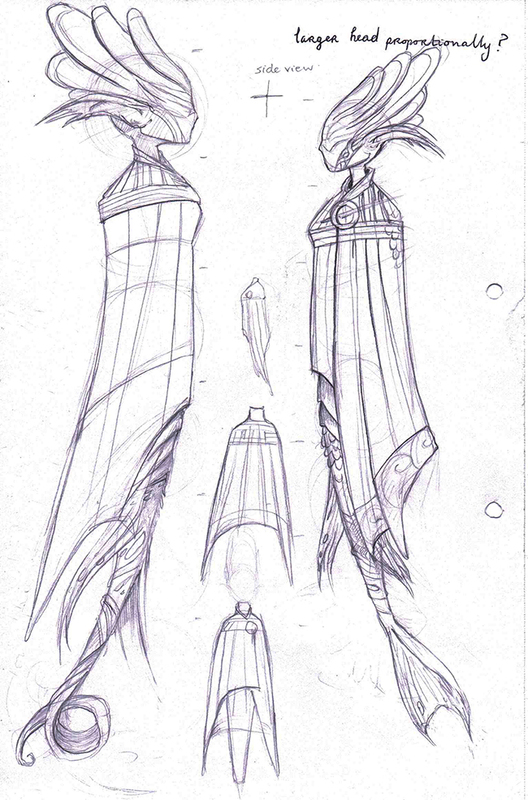 Also do you prefer the neck being covered like in the second drawing or the cloak following the body more closely? Any preference for the tail? Is the length okay in the last drawing? I haven’t drawn any finished looking Celtic patterns. I thought it’d be nice to have a clear connection between the patterns on the rocks and the patterns on the character’s clothes and face. Abigail and I were also discussing how it might work well if the character is very light coloured (maybe glows slightly) to stand out against a darker background? Like in Ori and the Blind Forest? After we decide on the character (so there’s something to start modeling from) I can quickly add some backpack designs also. I was thinking about what Andrew Deegan had been telling us about good game design having a character with a strong and instant read against the background. Although we’ve been through this a lot before when painting values it might be easy enough to forget when we move to 3D so we should pay extra attention to this. I stumbled across this game that might be some good inspiration to us as it has a very light/white character against a dark background: Ori and the Blind Forest. 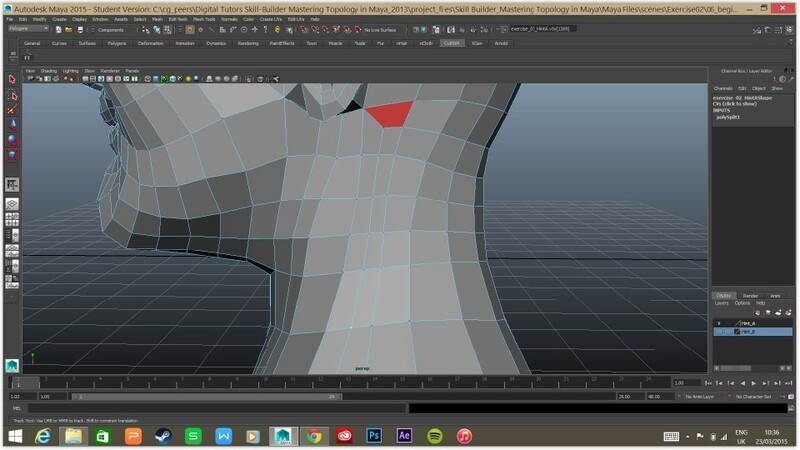 I figured it would be a good idea to learn as much as possible about topology before we even begin modeling our character for our Hard-soft animation. 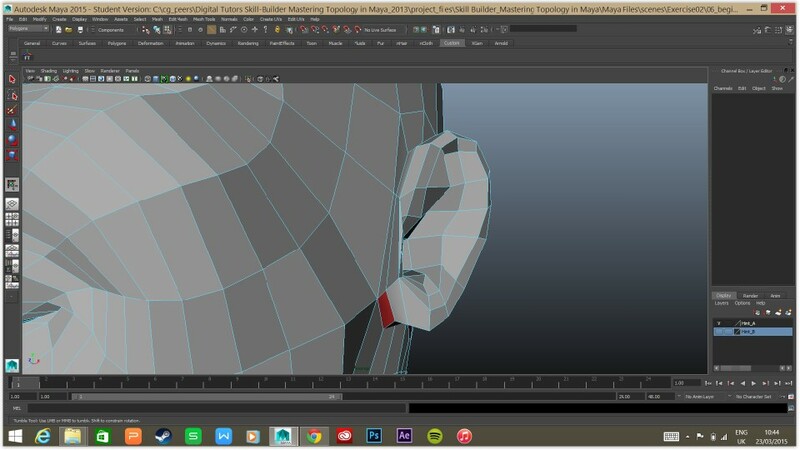 The ‘Mastering Topology in Maya‘ series on digital tutors has been good so far for getting practice and seeing all the things that need to be taken into consideration. 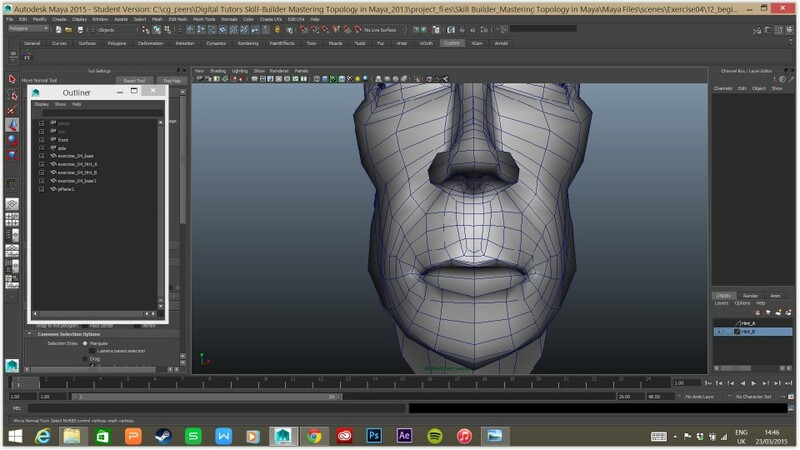 This will also be useful for modeling the head in our Imaging and Data Visualization module. N-gons: Are polygons with more than 4 sides. Think not as ‘deleting an edge’ but ‘moving an edge’. 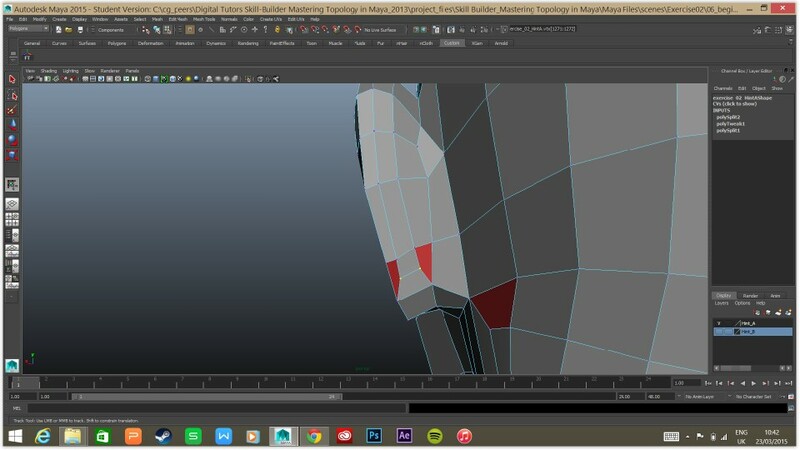 Create new edges and either delete triangle’s edge or select vertices and merge components. If triangles are close together, can they be eliminated by creating an edge that extends between them? (either in an enclosed area or looping entirely around symmetrical geometry). I solved this a different way at first but it’s good to look for end edges close by that you can extend a new edge down to. Triangles close together can be solved by connecting an edge between them. Seems easy now but I over complicated it at the time as usual. Merging vertices with the ‘merge components’ command is useful. Poles occur when more than 4 edges converge on a point. Is the pole in a place that will be deforming or static? 5 pointed poles usually occur at the edge of mouth and eye loop groups. Consider which poles are acceptable and which need to be changed. 6 pointed poles can be turned into two 5 pointed poles. Edge loops match what the model need to do i.e. let you know where and how you can deform your polygons. Deformation needs resolution e.g. loops which describe the nasolabial folds/laugh lines. Loops can be rerouted to add extra resolution to these places. 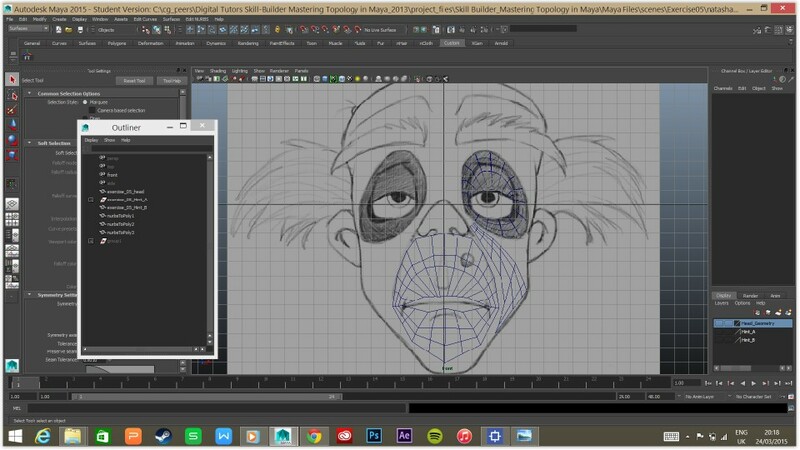 The loops around the eyes and mouth (and rest of face) should follow the flow of muscles underneath so facial geometry can deform correctly. I’ll need to study more references to get a better feel for what way the loops curve around. How can you connect an area with high density edge flow to one with lower resolution? e.g. 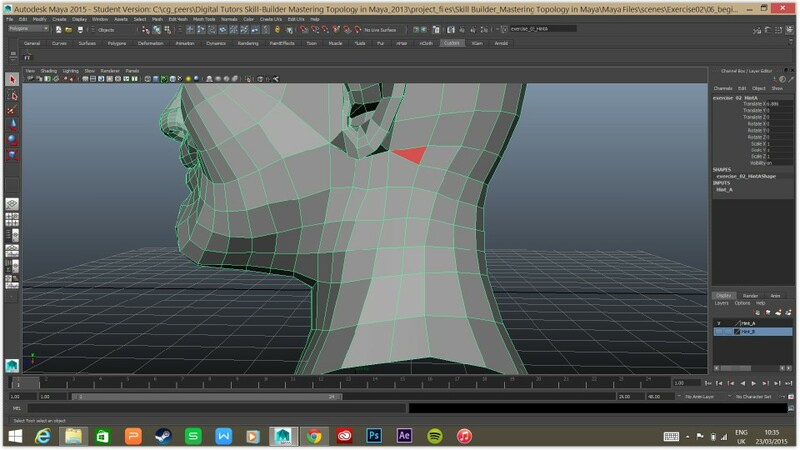 the front of the face has a high density to accommodate facial deformation compared to the back of the head which is static. resolution is needed in areas that bend. 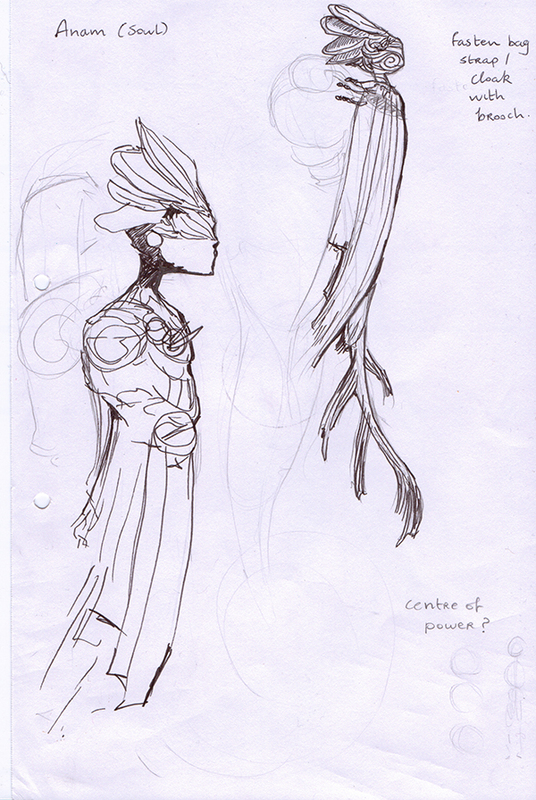 Look at sketches and concept art of the character. Discuss what way the character will need to move. Will areas need resolution for squash and stretch? Movement of the weather and elements. Movement of groups can amplify an emotion. Repeated movements of a single character can become recognisable. The camera movement has a beginining, a middle and an end. ‘If you know what the scene is about, try to express it through movement’: How is the character feeling? Is there any way they can convey that by moving? Can background weather/elements convey how they’re feeling? Helping to plan shots for the Genome Tower has made me realise all over again how much I need to learn about cameras and planning moving shots alone. 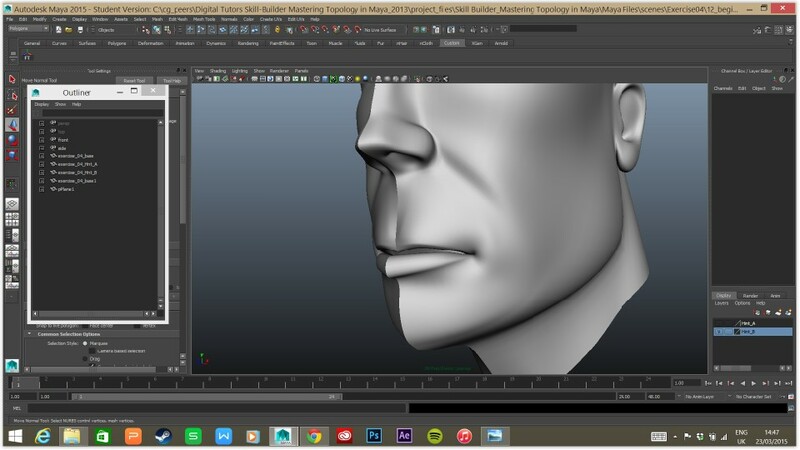 It will be particularly useful to learn about for our Hard-Soft animation project also. This Telegraph article and video on Gravity‘s (2013) behind the scenes is also very interesting! Haha, 7000 years to render on one computer…. This is Kerry, Christian, Matthew and I’s finished project for the building Belfast design brief. The song is Emerge From Smoke by Shlomo which Kerry found. Unfortunately youtube mutes it every time I upload but it’s too good of a fit to replace. Modeled heatsink. 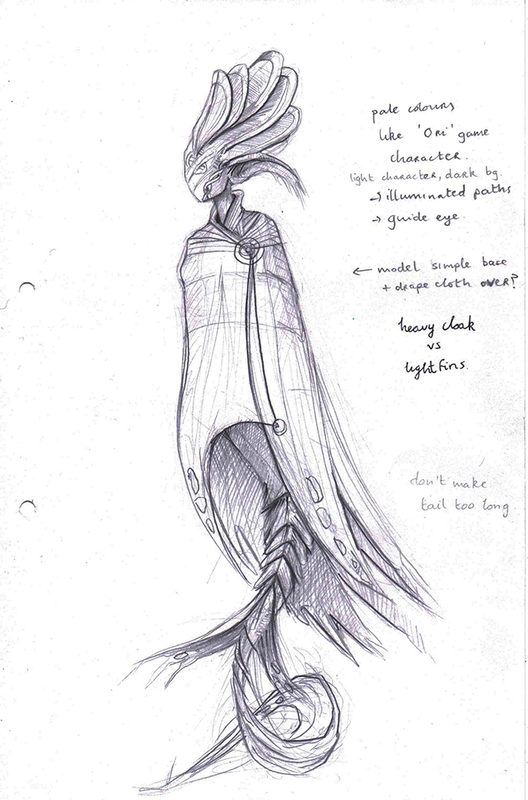 Helped design model concept art. We liked the effect of varying depth of field and pulling focus but it added a lot of time to the render and the view in the view port was a lot different than what was being produced in the mental ray renders. We decided not to use it this time but it’s definitely something to consider for the future.